Looks like McDonald's Shamrock Shake has some competition from Arby's. Admittedly, I've never liked Shamrock Shakes. The mixture of vanilla and mint syrup doesn't appeal to me and it always ends up nauseating to me. 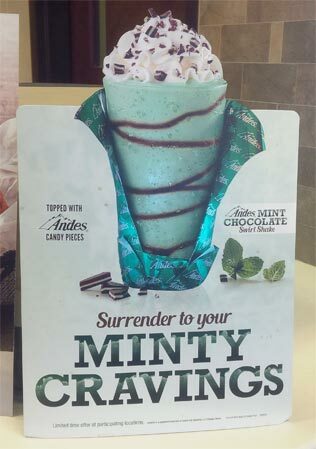 I mean, why not just mix mint syrup into a chocolate shake? Sure, you won't get the color but I bet it'll taste a whole lot better. Rant aside, I have faith in Arby's. I mean, they are using Andes and I love those things. After receiving mine, there's obviously some variation when it comes to the chocolate swirl on the side of the cup. The person who made mine doesn't seem to care about aesthetics. Thankfully we all know fast food advertising is a lie. It's all about the taste and this delivers. The shake tastes exactly like a block of Ande's. The flavor is so dead on that it's actually kind of scary. Food science is a beautiful thing. The shake might look all mint but there's definitely chocolate mixed in there somewhere. The swirls on the side don't do much for the flavor and are way too hard to mix in for what they add. If only the person who made mine made them look pretty and then they would've served some sort of purpose. The texture isn't as thick as I'd like a shake. It's a very drinkable shake with little extra effort to get through the straw. I'd be lying if I said I didn't inhale this one. The weather has been nice here and this shake just hit the spot. 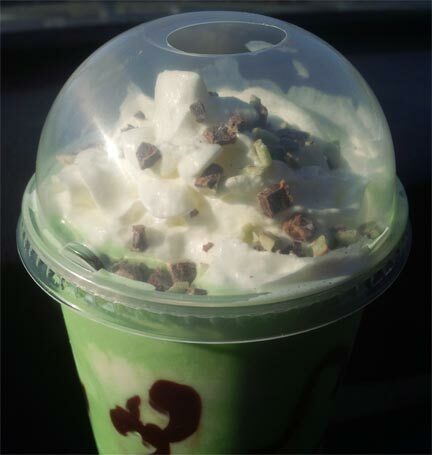 Next time you're thinking about a Shamrock Shake, head to Arby's and get this shake instead. You won't be disappointed. That swirl is straight up sloppy...Slopy good though.